Our expectations for superhero movies have changed since 2000 when Unbreakable was released. That film ostensibly shifted the perception of superhero movies from escapist entertainment to Films That Should Be Taken Seriously – or at least, that’s what M. Night Shyamalan wanted to happen. You have to remember, Unbreakable was M. Night’s follow-up to The Sixth Sense, which broke box office records, was nominated for Best Picture at the Oscars, and announced M. Night as some kind of new wunderkind Spielberg/Hitchcock hybrid. He needed to make an Important Film, while staying true to his instincts as a storyteller. Has Unbreakable dated well over the years? Yes and no. The performances are still terrific – an engaged Bruce Willis is always a treat, and Samuel L. Jackson digs deep into the intricacies and intimacies of Elijah Price – but in a world of cinematic universes and the dominance of superhero movies at the box office, Unbreakable plays almost quaint today. That is, of course, Shyamalan’s intention – a superhero movie grounded in some semblance of reality. So, forward to 2019, and Glass, Shyamalan’s return to those characters after Unbreakable and 2017’s Split, and for the first time in a while, we have high expectations for an M. Night Shyamalan film after a few years of the director wandering in the forest. After so many superhero movies, we welcome his take on the genre, and how the conversation has changed. But Glass doesn’t subvert those expectations so much as it simply fails to meet them. It’s a delicate house of cards that Shyamalan builds, but instead of gracefully adding the top pieces, he casually comes in with a leaf blower and scatters everything to the winds. I’ve rarely seen a third act fall apart so quickly and sloppily. It’s a shame, too, because that first hour or so is Shyamalan at the height of his abilities. He weaves all the characters in remarkably well (a note – Glass is not a standalone film in any way; if you haven’t seen Unbreakable or Split, or if it’s been a long time, you really should watch them before going in) and establishes a tone early on. Over the past 19 years, David Dunn (Bruce Willis) has been protecting the streets of Philadelphia, secretly, as The Overseer (or The Green Guard; Glass seems to have a bit of fun exploring superhero personas) with the help of his son Joseph (original actor Spencer Treat Clark returning). Dunn is not conflicted about his role and his duties, and Willis plays him as a man at peace with himself, and I really enjoyed his work here, especially with Clark. But a new terror is haunting the back streets of the city – The Horde (James McAvoy), who has killed several young girls already. Only one woman, Casey Cooke (Anya Taylor-Joy) has been able to get close to The Beast, the animal personality of The Horde, and survives, because she is the only one who knows how to connect with the one personality of The Beast’s that can put a stop to The Horde’s destruction. When The Beast and David Dunn finally come head-to-head, they also come into the radar of Dr. Ellie Staple (Sarah Paulson), a psychologist who studies a particular kind of personality disorder. She manages to get both David and The Horde into her mental institution, which also houses Elijah Price (Samuel L. Jackson), David Dunn’s nemesis from 19 years before. And as things develop, Elijah’s plans come into focus for them all. Glass gives us Shyamalan at both his best and his worst. As a director, he is an expert at building tone and tension, and those skills have not lost their edge over the years. A lot of Glass plays exactly like Unbreakable, taking all this comic book silliness seriously, and trying to dig deeper into humanity’s need for mythology and storytelling, but he undercuts those moments by refusing to expand his story to the parameters that we are used to seeing in superhero movies in the present. He refuses to go bigger at the places where it feels like the story demands it. For someone who is making a movie exploring comic book and superhero tropes, Shyamalan seems reticent to use them when the story calls for them. But he’s also getting great work from his actors here. Bruce Willis isn’t sleepwalking here, and I wanted more of him. In regards to David Dunn, Glass feels like a movie that’s almost 10 years too late; the moments between David and his son Joseph suggest an interesting story has been taking place in those 19 years, but we barely scratch the surface of it. Samuel L. Jackson steps back into Mister Glass like he never left, and seems to be having a lot of fun doing it. And there is the exemplary work of James McAvoy who still astonishes as The Horde. He is the best actor in Glass – he puts each personality shift in the eyes, so that, often, we know what personality is within him even before he speaks. 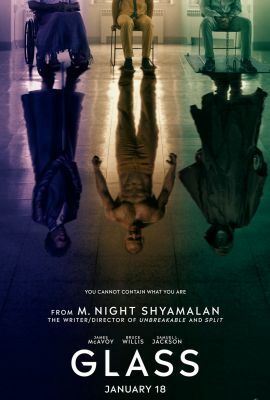 If you’re looking for an honest portrayal of Dissociative Identity Disorder, neither Split or Glass will fit that bill, but what McAvoy and Shyamalan are doing here is serving the context of the story, not any scientific accuracies. To get into why the third act breaks down so completely would require going into spoiler territory, but to summarize – we know what we expect in these kinds of movies. Shyamalan wants to give us an alternative to the Big Bang Boom that we so often see, which is admirable. We welcome something different at this point; for all the joy these big superhero movies give us, it all blends together after a while. We crave an ending that matters, and not just something that sets us up for the next installment. Shyamalan wants to deliver on that front. But he doesn’t. Instead, we get a very clunky climax that makes no logical sense, and has his characters behave in ways that are the opposite of what has been established before. There’s no weight to any of it, and without the scale that we’ve seen in other superhero movies, it all plays as very silly, as McAvoy growls and snarls while an obvious stand-in for Bruce Willis gets thrown around a parking lot. Some will claim that this subversion of superhero tropes is clever and brave; I would call it lazy and a cheat. Worse, it’s boring. It almost feels like he ran out of money at the last moment, because he fails to deliver on promises seemingly made throughout the film. There is keeping the action grounded, but you better be able to orchestrate it well and give us a sense of scope. When certain characters are offscreen in the climax, it’s almost as if they are waiting around for the camera to come back to them before they do anything. It’s all very sloppy and random. There will be a lot of discussion about Glass, especially from Unbreakable fans, and those who dismiss the movie will probably be inundated with a lot of hooey about how we didn’t get it and how we missed the point. But I can’t excuse bad filmmaking on the level that we get at the end. 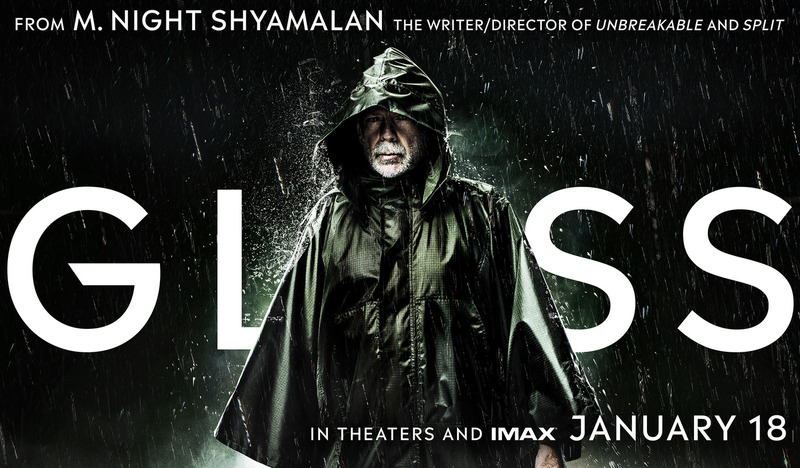 Shyamalan is a gifted director, who can get great performances and build terrific tension with only a little. But, when you take away all the twists and the oh-so-clever examinations of plot and mythology, what is left feels like seeing someone afraid to actually tell a story with any substance. What we get is a superhero movie that pulls its punches, and no one wants to see that.